Special Containment Procedures: SCP-069 is stored in its original packaging in a standard Safe-class object secure locker at Site 19. Access to SCP-069 requires prior permission from at least two (2) Level-3 personnel, and SCP-069 may only be used on a secure, isolated computer in the Anomalous Data Laboratory of Section 3. Use of SCP-069 on any terminal with a live network or internet connection will be cause for immediate revocation of access rights or termination. Personnel found using SCP-069 for excessive periods of time or in dereliction of duty will be terminated immediately. Description: SCP-069 was retrieved by SCP-507 during a displacement period lasting from ██/█/200█ to ██/█/200█. Upon his return, SCP-069 was found in his possession and immediately taken into custody by the recovery team. SCP-069 appears to be a commercially produced software DVD and accompanying instruction manual in its original soft case. When placed into any PC with a supported Windows operating system, the disc appears to contain a Japanese-style "dating-sim" visual novel program in English. 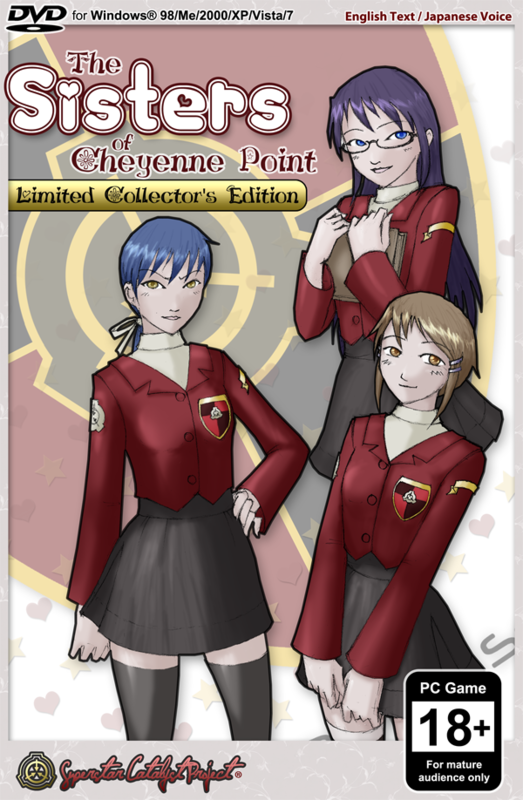 The title of the software is "The Sisters of Cheyenne Point" by "Superstar Catalyst Project". SCP-069 is reportedly "very well written" and "decently drawn", according to male test subjects who have been exposed to the software. Such subjects will often use SCP-069 for hours at a time, neglecting all other activity in an attempt to attain "100% completion". Female test subjects exhibited little to no interest in SCP-069. Possible memetic properties are under investigation and all exposed test subjects have been quarantined under standard memetic agent screening protocols. Addendum 069-1: Research into SCP-069 has yielded no memetic properties. SCP-069 has been reclassified from Euclid to Safe. Welcome to Cheyenne Point Academy! Your name is [REDACTED], and even though you've never had much luck with girls, your luck is about to change! You've just moved to the beautiful city of Cheyenne Point, and with a new school comes new opportunities to find friends and love in the shadow of [DATA EXPUNGED]. T.J. ██████: You are a new transfer student at the prestigious Cheyenne Point Academy and have moved to the city of Cheyenne Point after having a nervous breakdown at your old school. A caring person, you have nonetheless never seemed to have much luck with girls, but with a fresh start in a new environment, maybe that will change! Karen █████████: The leader of the Sisters Club, Karen is strong and stubborn individual who despises bullies and never backs down from a fight. She was nicknamed "Break" by the other students for supposedly breaking the arm of an upperclassman, but under her tough exterior is a soft side that is rarely seen. She saves you from delinquents on your first day of class, and seems to have taken a keen interest in you. Beatrice ██████: Athletic and always energetic, Beatrice is a small but feisty competitor who loves to win at sports. She is playful and outgoing, but worries that others think she isn't mature or feminine enough because she has never had a boyfriend. Rachel █████████: The class representative of your homeroom and a top student at Cheyenne Point Academy, Rachel is a kind and caring figure who is always willing to help but secretly isn't very confident about herself. She prefers to be called by her last name, and her favorite animal is the raven. ████████ Kondraki: An upperclassman and captain of the fencing team, he is extremely arrogant and abrasive to those who he doesn't consider one of his henchmen. An infamous bully, you manage to accidentally get on the bad side of his cohorts on your first day at school. Dr. Gears: The principal of Cheyenne Point Academy. He doesn't talk a lot, is usually emotionless, and isn't seen around the school grounds very much, either. Keeping to the administrative hall of the Academy, a lot of students think that he might secretly be a robot with human skin. Dr. Bright: The vice-principal of Cheyenne Point Academy, he is aloof, sarcastic, and feared for his strict punishments. However, he is also your [REDACTED] and helped you get back onto your feet and into this school after your breakdown, so what could he be hiding under that harsh exterior? Mr. Strelnikov: A history teacher at Cheyenne Point Academy, he often teaches lessons that may not necessarily be historically accurate. He also yells a lot and scares the underclassmen who are unfortunate enough to be in his class. Dr. Clef: Another teacher at Cheyenne Point Academy. Never seen in a classroom, no one is quite sure what he actually does at the Academy. His creepy attitude, tendency to stalk people, and the fact that his face is almost always hidden behind a huge hat has a lot of the female students thinking that he's a pervert. For additional information regarding SCP-069's contents, please see the Research Log for SCP-069.